How to Prepare for Second Round Interview? You have cleared your first interview round, and now you have been called for the second session. It seems exciting, but it will be more intense than the first series. The first round is mainly a screening round for most of the companies, where the employees are judged on core standards. Those who can meet the basic standards of a job are called for a second round. So it is good that even you have been called for it, but this does not confirm that you are ‘HIRED’ for the job. Hence, you need to prepare even more thoroughly and wisely to clear this level. Most of the times, the second round, tests a candidate for its competencies and a behavioral set of skills. Besides this, there are more other reasons to why a company conducts a second round of interview before it finally hires an individual. So, to know everything about the second job interview round all you have to do is, read this article completely. Usually, a candidate has to pass through a second round of interview before he gets finally selected to a job. Such a round is conducted to test traits of a candidate, which the interviewer was not able to make out during the screening, the first round of interview. While the first interview session offers a glimpse to your professional standards and qualifications. The second job interview round helps to identify that whether your skills set matches well with specifications of what the company is looking in a new employee. Every entity has a different work culture and scenario. So, to make sure that you are comfortable and able to deliver productive results the company will introduce its work environment to you during the time of interview. 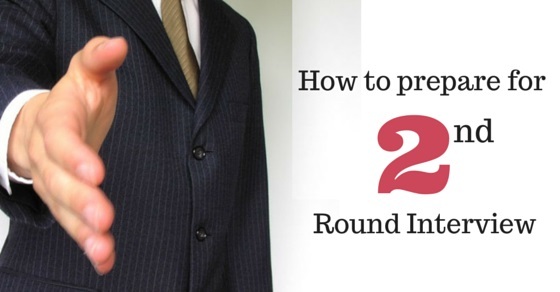 What to Expect in a Second Round Interview? No matter to which field you belong, if you have been called for a second round of an interview, then there are some typical things that you can expect. Since, the second round of interview is mainly conducted to judge your behavioral and competency skills set, it is for sure that the HR manager or HR executive will be the first person to attend you. It is because, in some organizations, he is the one who is sole responsible for judging your behavioral set of skills. Having a tour of the company may not be scheduled for your session, but it is you who has to show interest in the job. You can ask on your own for having a small visit to the organization, but only, if you have enough time. You can expect a concise meeting with the department managers, heads, executives, or even trainees, during your second round of interview. It may be because the recruiting employer wishes to see how comfortable you are meeting with others. It helps them to understand how you behave during new interactions. Surely, the interviewer has called you for a second round of interview, as you seem interesting to him. Before you get to your second round of job interview, there are few things that you need to remember. These are even your preparation strategies for the next step in the interview ladder. Surely, this is the thing that you have been told during your first interview session also. But again you have to remember it. You can check the press, social sites, and other vital links online, besides the company’s website to know deeply about its working structure, products, rules and policies. Don’t think that if you have been called for the next round, then you have made it through the job. You have to maintain the same zeal and enthusiasm that was driving you on the first round of interview. Remember, that first impression is the last impression. During your first round of interview you must have prepared certain notes about requirements of the employer. Try remembering all and summarize what you have written. You can look for goals set by them for an employer, or qualifications they want most, and more. Think about your conversation with the employer and try creating responses that can meet their needs. But remember while doing so you don’t have to lie. You have to remain honest and produce information, which is subject to you. You can prepare a list of questions that you wish to ask from the employer. It is because it will be the best time when you can ask all issues that were driving your mind. Make the best use of this opportunity and make sure you remove all your doubts about the company and it’s working before you finally join it. Don’t only prepare for questions. You must also need to practice and think about answers to various questions that the interviewer might ask you. It is true that you have passed the first round, but the way is still long. So make sure that you don’t let your confidence go down. Make a sustainable level of confidence even during this round of interview. Rather believe that if you have got the second call, then surely you are doing an excellent job. So, keep on doing it. You must have discussed best of your experiences in the first round itself. But don’t limit yourself and dig deep within, you will find more impressive experiences and answers to share. Add more resource to your stories, and more strategies related to work to create a better response to questions put up by the employer. The war has not yet ended! You, therefore, have to produce more innovative ideas and strategies to present it the interviewer. Think creatively and logically, as it will help you to frame answers that can meet employer’s requirements with ease. You are excited for your second call from the company, and maybe you have lots of stuff to speak out. But, you have to be patient. You cannot speak everything in one go as this might make you lose the job offer. It is, therefore, wise if you stay succinct and concise while answering different questions during the session. It is an excellent way to follow- up or thank the HR manager once your interview is completed. It will not only help you create a great impression on the HR manager and even other recruiting bodies, but will also help you to keep a regular check on your status. During the second round of your interview, employers will ask more ‘job specific’ questions like about the company, the job profile, your ability to work under stress, your productivity, and how your knowledge and skills can bring productive returns to the enterprise. 1. What sort of challenges are you looking forward to your new position? 2. Why do you think this will be the perfect job for you? 3. What relevant experience do you have regarding the job post we are offering? 4. What is that interests you the most about our company? 5. What will be your contribution to the company if we hire you? 6. What do you think about our company’s work policies that have been presented to you? 7. Will you be able to work with due punctuality and flexibility? 9. Why do you think you will be the best candidate for our company? 10. Are you comfortable working alone or you can deliver productive results in a team also? The second round of interview might be a step ahead to your job offer letter, but surely it will be more intense and rigid to succeed. The interviewer will test you on vital skill sets in a deep yet intrinsic manner. Hence, it is your sole duty that you prepare well for this interview round. Maybe this might be the last interview series, or might be just another level out of total five interview sessions. But no matter it is last or not, you have to try hard to succeed in it.